A resilient Dixie Twist graduated in style Saturday at Woodbine, capturing the $139,000 Ontario Debutante Stakes over the charging longshot Roaming. 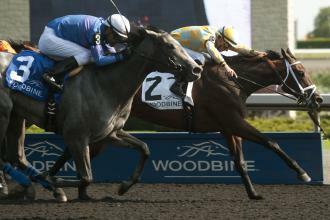 Dixie Twist, ridden by Gary Boulanger, beats Roaming by a head in the Ontario Debutante Stakes on Saturday. Dixie Twist ($6.80) dueled up front with 9-5 favorite Starless Night through splits of 22.52 seconds and 46.06 in the six-furlong dash for 2-year-old fillies. Unhindered, the expected pacemaker, broke a bit slowly before making a four-wide move to the lead on the turn, but she tired in the final sixteenth, as Dixie Twist came back on to prevail by head in 1:11.14. Sweet Dreams nosed out Unhindered for third, while Starless Night faded to last in the six-horse field. Gary Boulanger rode the Mark Casse-trained Dixie Twist, who won $90,000 for owner John Oxley.